Esto es parte de las muchas frases y pensamientos que componen el monumento a las víctimas del 11-M en Madrid. Son frases en muchos idiomas. Palabras para recordar. Ideales a mantener. Y libertades por las que luchar. 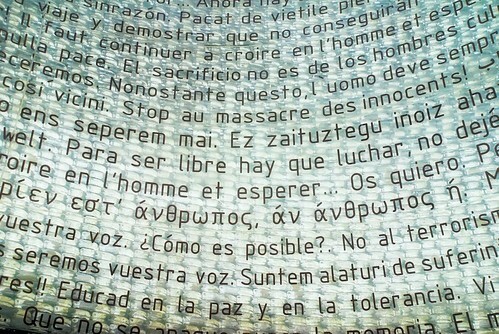 This is part of the many sentences and thoughts that compose the monument to the victims of the terrorist attack in Madrid, on 11 march. They are sentences in many languages. Words to remember. Ideals to keep. And freedoms to fight for.